Wow this week there were a number of entries into the challenge, and they were all so amazing and creative. I did notice all the different card entries and they were all so beautifully created. Thank you to all of you that entered this challenge, it was tricky picking a few to highlight here. These little 'love bugs' were cleverly created by Sue Kment. These are so adorable and really well done. Next up is this beautiful card created by Twisted Witch. Despite what seemed to be a few bumps in the creation of this, your card turned out beautifully and I loved the clear look to it. And who couldn't resist a card showing the city of love - Paris. Jose's card here is just so cute and well designed, with the pops of red contrasting well with the black and white. 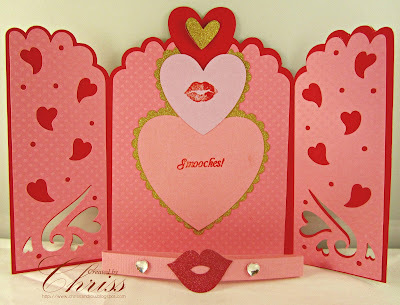 Last but not least, this very creative card created by Scrappin with Chriss. Love the open flap type design to it, definitely adds something a little different. Again all the entries this week were so amazing and very creative and unique. Thank you again for joining us here at Use Your Stuff.